Complement the style of the furniture and the room: Pick a light fitting that relates to the dining room furniture, and not only the room itself. It should complement the furniture and the room in terms of size, shape and style. Round fixtures such as chandeliers for example, go best with round tables, whereas light fittings with a more linear design complement more modern rectangular-shaped tables. Get your proportions right: Any dining room light fitting ought to be a minimum of 30cm smaller than the table it hangs above in all directions. So, for a 1,2m-wide table for example, you want to look for a light that's no more than 60cm wide. Lights with a linear suspension should measure anywhere from 1/3 to 2/3 of the length of the table below. 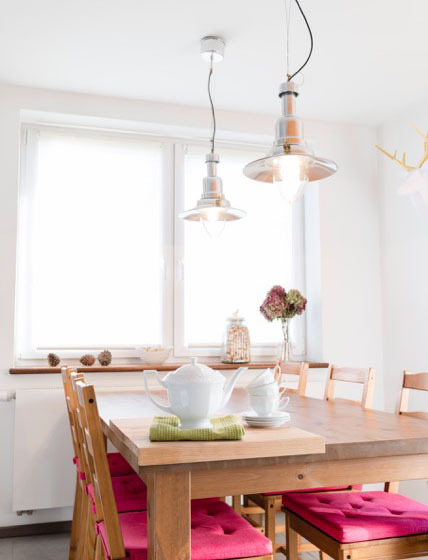 Consider the height: All dining lights should hang about 80cm above the surface of the table. 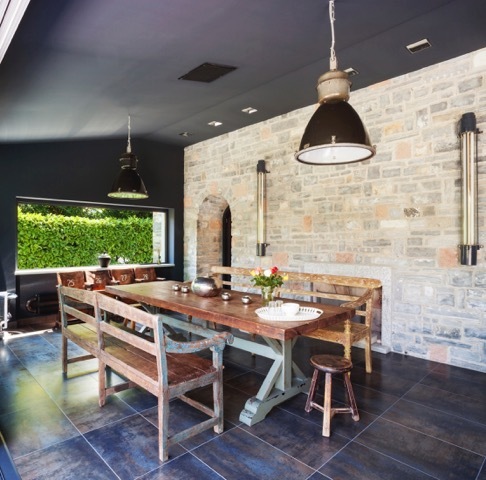 This way, the light fitting won’t get in the way of any guests sitting opposite you at the table, but it will still be close enough to provide enough illumination for optimum functionality. Dim the lights down: In order to govern the ambiance of the dining room, it is a good idea to install a dimmer switch to control the brightness of the dining room lights. This way the lighting can be dim for a cosy and intimate dining room setting, or brightly lit for a family dinner. Use layers: A decorative light fitting in the dining room generally offers a low level of light output – these lights are more about setting the mood and creating a focal feature in the room. For a more functional style of lighting, it is advisable to create a layered lighting design, which comprises ambient, task, feature and general lighting. When adding layers of light, think both vertically (layers from the ceiling to floor) and horizontally (layers from one side of the room to the other).